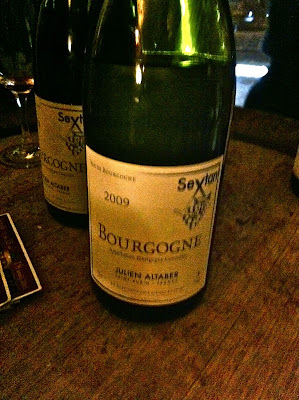 For instance: the surprisingly masterful Bourgogne AOC wines of Julien Altaber, a protogé of the Derains, who after working for them for years has recently begun making his own wines, using their facilities in St. Aubin. When J and I approached, he was standing looking kind of marooned near an entrance to the catacombs, by a barrel upon which stood the three wines he's bottled to date: a 2009 Bourgogne Blanc, and two Bourgogne Rouges, from 2008 and 2007 respectively. From what I understand the wines all derive from fruit sourced from just outside the St. Aubin appellation, which is itself known as a bargain among Burgundy appellations, typified by high-toned, acid whites and raspy, sinuous reds. Probably due to the cold that I mention in every post about this tasting, and its muting effect on everything but reds especially, Altaber's 2009 Bourgogne Blanc left the strongest impression of the three wines we tasted. Just perfect shimmering clarity, wire-tight acidity, and an avalanche of mineral: everything I could ever want from young basic white Burgundy. The reds, what I was able to perceive of them, were similarly crisp and chiseled, with assertive citrus and raspberry notes. All in all, a killer starting line-up. It reminded me of listening to the Strokes' first album - you knew the songs were good, really great actually, so good, in fact, that you suspected they could only have come from some kids who had serious access in the first place. Which of course, as with the Altaber / Derain connection, turned out to be the case. The songs remain awesome, anyway, even a decade on. I have a feeling these wines, and whatever Altaber follows them with, will reveal a similar timelessness. * I like the Derain wines I've tasted. This was a purely practical decision. Since their wines are available at just about every cave I frequent in Paris, I figured I could defer the pleasure to another time. Neil Young & Aligoté: Derain's "Allez Goutons"